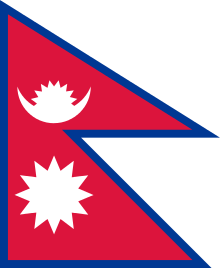 Limbu is a Sino-Tibetan language spoken in Nepal, India (Darjeeling, Kalimpong, Sikkim, Assam, and Nagaland), Bhutan, Burma, Thailand, the United Kingdom, Hong Kong, Canada, and the USA. It is falsely believed that Limbu's/Yakthungs are multi-lingual, but there are hundred and/or thousand of Yakthungs who speak only in Yakthungpan (Limbu language). Limbu's refer to themselves as Yakthung and their language as Yakthungpan. Yakthungpan has four main dialects: Phedape, Chhathare, Tambarkhole, and Panthare dialects. Among four dialects and/or many dialects, Phedape dialect is widely spoken and well understood by most Yakthungpan speakers. However, as there are some dominant Panthare scholars who have role to create knowledge and control knowledge in the Limbu communities, Panthare dialect is being popularized as a "standard" Limbu language. As Panthare Yakthungs are much more engaged in central political position and administrative positions, they are trying to introduce Panthare dialect as a Standard Yakthungpan. Yakthungpan (Limbu language) is one of the major languages spoken and written in Nepal, Darjeeling, Kalimpong, Sikkim, Bhutan, Burma, and Thailand. Today, linguists have reached the conclusion that Yakthungpan resembles Tibetan and Lepcha. Before the introduction of Sirijanga script among Limbu Kirat's, Rong script was popular in East Nepal specially in early Maurong state. Sirijanga script had almost disappeared for 800 years and it was brought into practice again by Te-ongsi Sirijunga Xin Thebe of Tellok Sinam Limbuwan present day Nepal. Limbu is spoken east of the Arun River in the following districts of Nepal (Ethnologue). Ethnologue lists the following dialects of Limbu. Yanggrokke, Chaubise, and Charkhole are minor variants of the Panthare dialect. Phedappe and Tamorkhole are similar. Chattare is less well understood by other dialect speakers. The Limbu dialect spoken in Sikkim, India is the same as Panthare. The Limbu script. Gray letters are obsolete. Limbu, Lepcha and Newari are the only Sino-Tibetan languages of the Central Himalayas with their own scripts. The Limbu script or Sirijunga script was devised during the period of Buddhist expansion in Sikkim in the early 18th century when Limbuwan still constituted part of Sikkimese territory. The Limbu script was probably designed roughly at the same time as the Lepcha script (during the reign of the third King of Sikkim, Phyag-dor Nam-gyal (ca. 1700-1717)). However, it is widely believed that the Limbu script (Sirijunga) had been designed by the King Sirijunga in the 9th century. The Sirijunga script was later re-introduced by Te-Ongsi Sirijung Xin thebe. As Te-ongsi Sirijunga Xin Thebe spent most of his time in the development of Yakthungpan, Yatkhung culture, and Limbu script , he is considered as the reincarnation of the 9th century King Hang Sirijunga. As Te-ongsi Sirijunga Xin Thebe was astoundingly influential person to spread Limbu script, culture, and language, Tasong monks feared him. Tasong monks feared that Te-ongsi Sirijunga Xin Thebe might transform the social, cultural, and linguistic structure of Sikkim. Therefore, Tasong monks caputured Te-ongsi, bound on a tree, and shot to death with poisonous arrows. Both Limbu and Lepcha were ostensibly devised with the intent of furthering the spread Buddhism. However, Sirijunga was a Limbu Buddhist who had studied under Sikkimese high Lamas. 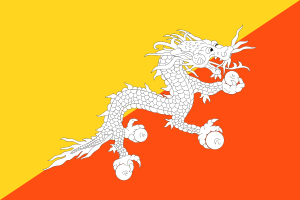 Sirijunga was given the title 'the Dorje Lama of Yangrup'. The language and script's influential structure are mixture of Tibetan and Devanagari. Unlike most other Brahmic scripts, it does not have separate independent vowel characters, instead using a vowel carrier letter with the appropriate dependent vowel attached. The Limbu language and literature has been less practiced in Nepal since the last eighteenth century. The cultural identity of any community was taken as a threat to the national unification by ruling elites until the recent years. The use of Limbu alphabet was banned and the possession of Limbu writings outlawed. There were no specific laws about it, but the Security Act was enforced for such cases under the strong directives of Kathmandu. Limbu has its own unique writing system, which is similar to Tibetan and Sikkimese scripts. The Sirijunga script is unique and scientifically designed by King Sirijunga in the 9th century; it was later re-introduced and popularized by Te - Ongsi Sirijunga Xin Thebe and his cronies in the 18th century. Since teaching of Limbu/Yakthung language and writing was banned by the Khas-Hindus in Nepal after the "Noon Pani Sandhi" between the Limbuwan and Gorkha Kingdom (Prithvi Narayan Shah), far more Limbus are literate in Nepali than in Limbu in Nepal. 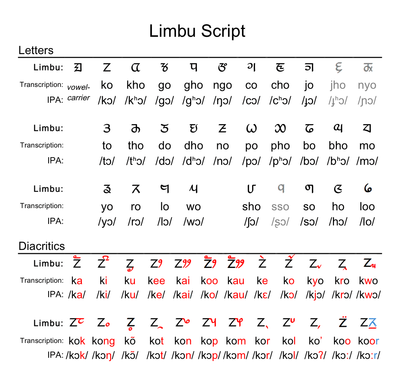 Although many Limbu books were written in Devanagari and Roman (English), now Limbus/Yakthungs have well developed computerized writing system and many books are published in Sirijunga script. Second Generation Limbu writers and rhetors: i. After the establishment of "Yakthunghang Chumlung" (1924); thereafter, several books were published. ii. Limbu script was much more influenced by Devnagari script at this period. iii. At the same time, both national and international linguists, researchers, and writers addressed the issued in this period. This period is period of inquiry, communication, discovery, and re/construction. Third Generation Limbu writers and rhetors: This period denotes after the restoration of democracy in Nepal in 1990. Introduction of "Anipan" at school; many research and writing such as MA/MPhil theses and research reports; establishment of Limbu organization at the local and global level; period of delinking, relinking, and linking epistemologies. The Limbu language has many papers and publications in circulation. Tanchoppa (Morning Star), a monthly newspaper/magazine which has been published since 1995. There are many other literary publications. The oldest known Limbu writings were collected from the Darjeeling district in the 1850s. They are the ancestors of the modern Limbu script. The writings are now a part of a collection in the India Library in London. In Nepal, the Limbu language is taught on private initiative. The Government of Nepal has published " Ani Paan" text books in Limbu for Primary education from grades 1 to 5. Kirant Yakthung Chumlung teaches Limbu language and script in its own initiative. In Sikkim, since late 1970s Limbu, in Limbu script has been offered in English medium schools as a vernacular language subject in areas populated by Limbus. Over 4000 students study Limbu for one hour daily taught by some 300 teachers. Course books are available in Limbu from grades 1 to 12. ↑ Hammarström, Harald; Forkel, Robert; Haspelmath, Martin; Bank, Sebastian, eds. (2016). "Limbu". Glottolog 2.7. Jena: Max Planck Institute for the Science of Human History.